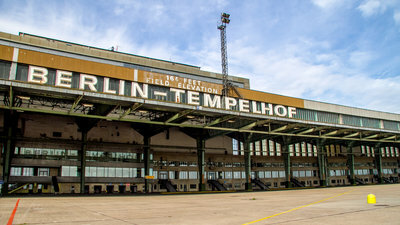 The former airport`s main building is the largest listed monument in Europe. It`s far from being a museum, choosing rather to remain a lively venue and site of a wide array of different events throughout the year. Changes in tour routes may occur as a result of events taking place on the site. Certain spaces can temporarily be closed to the public, which means that the thematic focus of the tours is subject to change. In exceptional cases on certain days, the tours must be cancelled entirely. These days are marked in gray in the online ticket shop. Please note that tours will not take place if the number of participants is less than five people. Unfortunately, as a result of the existing building structure, our tours cannot be adapted to the needs of the disabled.